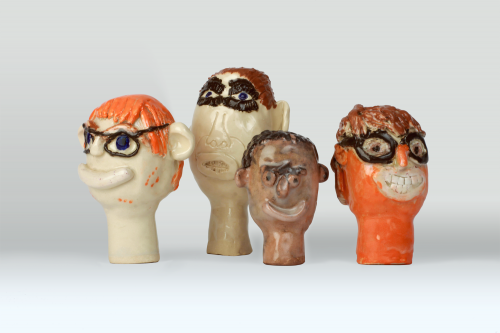 Image: Ceramic heads by Darren Gallagher, Andrew Johnstone, Ahmed Mohammed and Kathy Wilmot. Photo by Ellie Walmsley. Exhibitions, happenings and accompanying events will take place citywide at multiple venues including; Fred Aldous Ltd, The Manchester Contemporary, Elizabeth Gaskell’s House, The Lowry, the Whitworth (Thursday Lates takeover), NOMA – Oh Ok Ltd, and Studio 53, Venture Arts’ new studio and exhibition space. On the 1-2 October, live from the Northern Quarters’ Fred Aldous Ltd art suppliers, artist Leslie Thompson from Venture Arts and Manchester artist and illustrator Matt Girling will draw inspiration from their memories, as well as capturing the bustling environment and passers-by in a large-scale site-specific drawing that will evolve into a fleeting interpretation of Manchester city life. Leslie Thompson, AKA ‘The Superstar Artist Drawer’ will be live capturing his interpretation of the fair on its opening evening of Friday 12 October. Text and line are leading themes in the artwork displayed at Elizabeth Gaskell’s House, the restored home of celebrated English novelist and writer Elizabeth Gaskell in Longsight. Taking place from 1 November – 2 December, emerging artist Michael Beard’s sizable text drawings, conveying hopes and dreams to explore the world will be exhibited alongside Florence Haskin’s neatly embroidered typography piece about her favourite YouTube videos. Also on display will be acclaimed artist Barry Anthony Finan’s porcelain scrolls, featuring his continuous lines of writing about his fascination with ‘TELEVISSIONS,’ the BBC and prominent figures in his life. The Lowry, Salford Quays, will display artistic highlights of artwork created by young artists who regularly take part in Venture Arts’ Young People’s Art Club. Artwork from three local primary schools, who worked alongside learning disabled artists to create an eclectic range of artworks, will also feature in this joint exhibition launching the 24 November until February 2019. In the up and coming NOMA area in central Manchester, OH OK Ltd, will host an exhibition highlighting larger collections of artwork. Examples include Terry Williams grainy black and white photography documenting times gone by and holiday memories that capture his sense of northern nostalgia and his love of the seaside. Horace Lindezey also shares his fascination with weddings, and everything associated with them, across clay, embroidery and photomontage.